Brunch is one of my favorite meals because you can sleep late and still have breakfast food, plus it'a also appropriate to drink alcohol - I love me a good mimosa! I also really enjoy omlets but I'm not very good at flipping them, honestly it's just too much work to bother with so when I make brunch at home, I opt for a scrambled omlet. 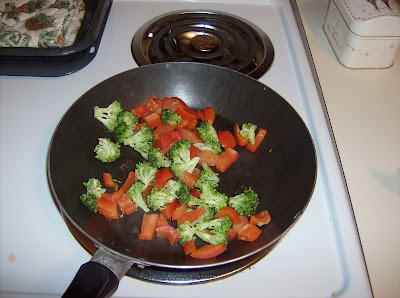 Chop up your desired veggies (in the photo I have brocoli, tomoatoes and red pepper) and put them in the pan with a splash of olive oil. If you want bacon or sausage in your eggs put it in first and you can probably forego the oilive oil because the meat will have enough fat, then add the veggies when the meat is almost cooked. Toss in some cilantro and garlic. 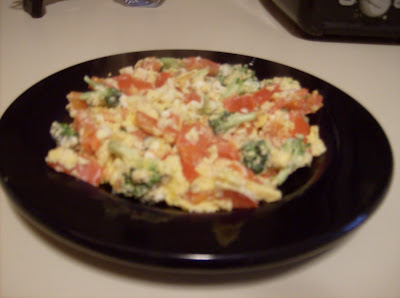 When every thing is fully cooked add the eggs and mix it all together and cook for 3 more minutes or until the eggs are done. Add some cheese (feta, swiss, cheddar...) and wait until it melts a bit before taking it off. Invite your single girlfriends over for brunch at your place serve this with some fruit, toast and mimosas (OJ & Champange) and then head out for some shopping. Fab way to spend the weekend. Or make it for yourself and sit on the sofa and veg, also a fab way to spend the weekend.